The Chichibu region in Saitama Prefecture is known for its deep Shinto and Shugendo roots, as well as its Buddhist 34-temple Kannon Pilgrimage. The city of Chichibu, about 90 minutes train ride northwest from Ikebukuro, Tokyo, has a population of approximately 60,000. The region, which sits in the shadow of Mount Buko and alongside the Arakawa river is steeped in tradition with more than 300 festivals taking place each year. So I was honored to be invited by Michael Pye, president of the International Shinto Studies Association to participate in a guided field excursion to Chichibu in April. The goal of such tours is for the participants to “broaden the knowledge about Shinto in living contexts, and to deepen their understanding of the roles which it plays in local communities,” says Pye. Although many of the cherry blossoms had long blown off their branches, the shidare-zakura (weeping cherry trees) were in full bloom, their willow-type branches cascading like pink flower fountains making for a lovely walk among the old Edo Period (1603-1868)dwellings. Chichibu was a major trading center for silk during the Edo Period and many of these old shops can still be seen lining the roads. One can easily imagine fields laden with mulberry trees, the leaves of which were fed to silkworms to produce the silk. A local guide introduced our group of 15 to some key spiritual loci related to Chichibu sects of Shinto and Shugendo, including Chichibu Shrine, Chichibu Imamiya Shrine, Imamiya-bo (temple No. 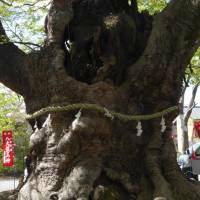 14 on the Chichibu Kannon Pilgrimage) and Hashidate-do (temple No. 28). In addition, we visited the Chichibu Matsuri Kaikan festival hall to learn more about the city’s well-known festivals. In 1868, Japan inaugurated religious reformations that separated Shinto and Buddhism and forbade the syncretizationof the two. Shugendo was ultimately banned. 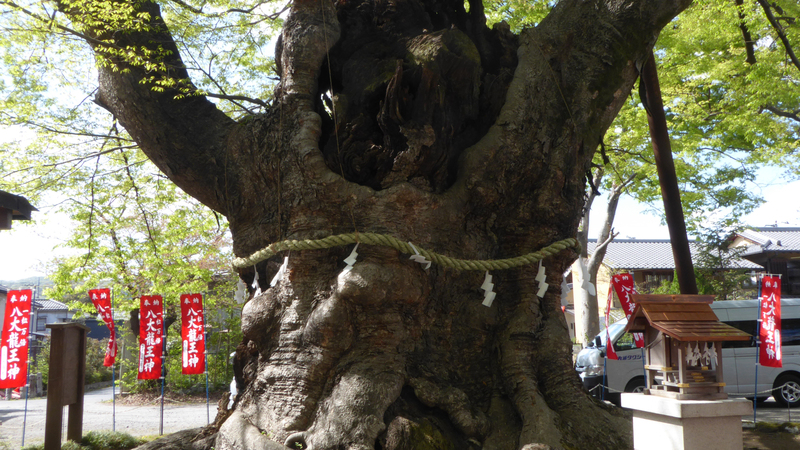 As we stood next to a 500-year-old zelkova tree in the grounds of Imamiya Jinja, the shrine priest Shionoya explained the history of the Chichibu area. Chichibu Shrine’s importance to the area is historically tied to Mount Buko, a reizan (sacred mountain) long worshipped by Shugendo practitioners and where these yamabushi ascetic monks previously trained. In addition to the kami (spirits) believed to reside in the sacred mountain, it was also rumored that a large serpent lived just below its peak. While walking around the Chichibu pilgrimage path, it is difficult to escape Mount Buko’s towering presence. Although shrines were traditionally situated in natural environments to be close to the kami who lived in mountains and near the streams, modern development has encroached to the point that, like many other shrines around Japan, Chichibu Shrine is now in the middle of the city. Because of the many tall buildings, the sacred Mount Buko is obscured. This obstruction, however, hides something much more sinister. If you go to the tabisho, the gathering point for the Chichibu Yomatsuri (Night Festival), you can clearly see the figure of Mount Buko. If you look closely, you will see dump trucks traverse the peak as they carry away its limestone to use in the production of cement. In her book titled “Chichibu: Japan’s Hidden Treasure,” Sumiko Enbutsu reveals that the townspeople have resigned to the destruction of Mount Buko as a necessary evil since their silk production dried up long ago and there is no other industry to create jobs. Yet the more than 300 annual festivals in Chichibu attest to the pride and efforts the town takes to keep its history alive. According to Sonoda Minoru, chief priest of Chichibu Shrine, the festivals serve to welcome the ancestral spirits and Shinto kami of the area. During the festivities, the spirits are entertained by the townspeople, who in turn receive the blessings of the kami. The major event is the Chichibu Yomatsuri. Celebrated on Dec. 2 and 3, it is one of Japan’s top-three float festivals, rivaled only by Kyoto’s summer Gion Matsuri and the autumn Takayama Matsuri. We were shown photos of Mount Buko, over the years from the Showa Era (1926-89) to 2008, and it was easy to see that in just 20 years the mountain has been completely desecrated. In addition, the changed environment has affected the natural flow of rainwater in the Chichibu area. “In the 1870s, Shugendo was banned and Imamiya became a Shinto shrine, with all “Buddhist” elements removed. Another 50 years later, in the 1920s, Bukozan was sold to a cement company that started to chew up the mountain,” said Mark Teeuwen, a participant on the trip and a professor of Japanese studies at Oslo University who specializes in the history of Japanese religion. Shinto priests such as Shionoya and Sonoda are concerned about the greater consequences of such encroachment on the environment. Sonoda warns that we are losing a “spirituality hidden within the blessings of nature” and he worries about how environmental destruction affects our society. It should be disconcerting that a mountain, the very image of strength and immovability, can be slowly cannibalized — like a mountain of sugar being disassembled by ants, removing it grain by grain and carrying it back to their nest. As Mount Buko is ravaged right before the eyes of the townspeople, surely they must feel some deep metaphysical loss. “Shinto in living contexts” is a concept that encourages us to consider how religious beliefs affect the present moment. While Buddhism is primarily concerned with death and life after death, Shinto concerns the present and the kami who have existed from ancient times. Living Shinto suggests that religion and the environment are intertwined, which is just what Japan needs to think about right now. For more information on the International Shinto Studies Association (ISSA), visit www.shinto.org. Japan Lite appears in print on the last Monday Community page of the month.